Roanoke Valley Ice is a full service ice manufacturing company in Roanoke Rapids, North Carolina. 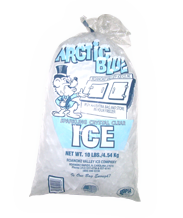 We manufacture and distribute high quality Packaged Ice to convenience stores, supermarkets, restaurants, seafood markets, manufacturing companies, construction sites, and other companies in need of ice in Eastern North Carolina and South Eastern Virginia. We also provide refrigerated trailers for any type of special event. Roanoke Valley Ice covers a wide delivery are from Roanoke Rapids, North Carolina. From Blackstone, Virginia north to Kenly, North Carolina south, Williamston, North Carolina east to Oxford, North Carolina west. Being located on Interstate 95, Roanoke Valley Ice is capable of shipping Packaged Ice quickly anywhere in the U.S. Trailer-loads of up to 22 pallets are available for shipping on your truck or trucking can be arranged. We are committed to offering the best delivery service available. For the highest quality Packaged Ice, let Roanoke Valley Ice Company be your Ice Company. Contact us today for more information to find out how we can offer full service delivery of Packaged Ice anywhere in Eastern North Carolina and South Eastern Virginia.